Lin-Manuel Miranda's next project is far away from Broadway, in a 35-mile-long stage. The artist is focused in helping Puerto Rico recover from the devastation Hurricane Maria has left. "Our next project is getting a sense of normalcy back to our island," he said more than a month after Maria hit hard. "Everything has kind of taken a back seat to that." The creator of "Hamilton" has been doing all he can to help the devastated land of his ancestor and will be honored this Thursday for his efforts at the Latin Grammys. Miranda will receive the Latin Recording Academy President's Merit Award for his "outstanding and numerous contributions to the Latin community," including his all-star song "Almost Like Praying." The ceremony will be aired live on Univision from Las Vegas. 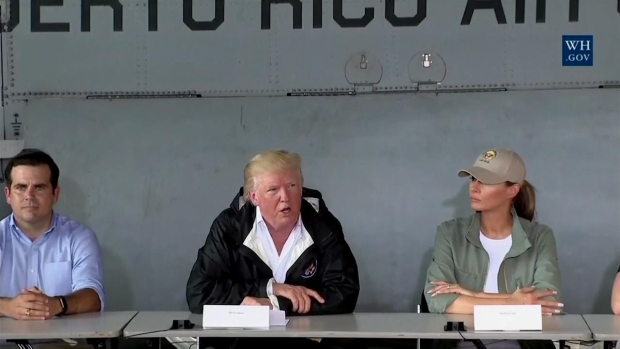 Speaking at a news conference in Puerto Rico Tuesday, President Trump discussed the impact Hurricane Maria has had on the United States budget, and compared it to Hurricane Katrina. In a recent interview with The Associated Press, Miranda expressed his faith in the American people after seeing the country come together in the face of natural tragedy, despite what he has said was a slow response from the US government. "Honestly I think we are still making up for the slowness of the initial response," he said. "That was the moment to put down a maximum effort, maximum troops, maximum everything, and it's happened. My hat goes off to every single member of FEMA, every troop on the ground, every member of the Puerto Rican National Guard that's working so hard there. But we're working at a deficit from the initial response and we still are." Two weeks after the storm he released "Almost Like Praying," a song featuring Jennifer Lopez, Marc Anthony, Camila Cabello, Gloria Estefan, Fat Joe, Luis Fonsi, John Leguizamo and Rita Moreno, among many others. All proceeds from downloads and streaming go to The Hispanic Federation's disaster relief fund. "Everyone worked from a place of love," said Miranda of the song, which he calls "a love letter" to the island and its 78 towns, all mentioned in the lyrics. Miranda also hopes to raise the spirit of the island by bringing "Hamilton" to the University of Puerto Rico — and him in the starring role — in early 2019. The composer, lyricist, playwright and actor lamented that after more than one month there are still many people with no water or electricity. More than 140,000 Puerto Ricans have left the island since the September 20 hurricane. "This would be so unacceptable in any city in the mainland of the United States. It's crazy that this is still where we are a month after the hurricane with so much of the island — not a very big island! Thirty-five miles top to bottom — still without basic resources," said Miranda. 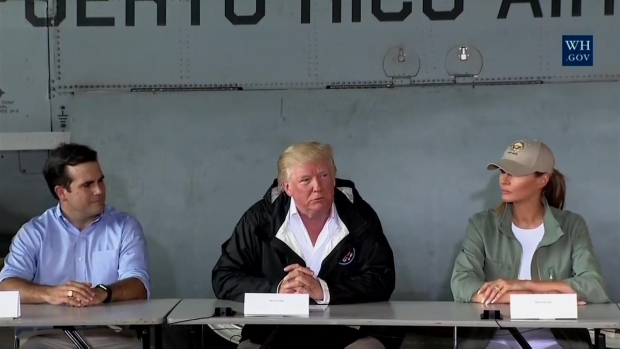 After landing in Puerto Rico Tuesday, Trump thanks the governor for his leadership while praising the fact he "didn't play politics" after Hurricane Maria. But in trying to "be the silver lining," he says he rather focus on the positive, like the $14 million the Hispanic Federation raised in 24 days through the Unidos Disaster Relief & Recovery Program. "And that's not big corporations, that's over 100,000 donations and really small increments," he noted. "It is a glimpse of generosity of everyday people — it's kids taking their piggy banks, it's local productions of 'In The Heights' raising money after the show," Miranda said, referring to one of his earlier stage hits. "I really have more hope than ever in us as people and the way our hearts extend out in times of tragedy."